A collection of books written by members of The Howard Stern Show. Long-time Stern Show fans will remember the hilarious stories and life of Johnny Fratto. Fratto was a guest from time to time on the Stern Show on SirusXM who unfortunately passed away in 2015. Before his death and Stern Show notoriety, Fratto was the owner of the custom motorcycle business Beverly Hills Choppers and partied with tons of celebrities. His memoirs are chalked full of stories from Hollywood. Is Johnny Fratto still alive? Does Howard Stern have a connection to Iowa, the Hawkeye State? Does Johnny Fratto’s book discuss Tom Cruise? No, unfortunately the Stern Show regularly died in November of 2015 after a battle with lung cancer. He was 61 when he died. Yes, he does, allbeit small! That connection is Johnny Fratto, who was born in Des Moines, IA in 1953. Fratto’s father, Louis Fratto, was a prominent Midwest mob figure from the 1930s until his death in 1967. You can learn more about his mob ties in the Johnny Fratto book. Yes, it does. Fratto and Cruise were friends. When Cruise was preparing for his role in the 1986 movie The Color of Money, he consulted with Fratto to get a better understanding the mafia. 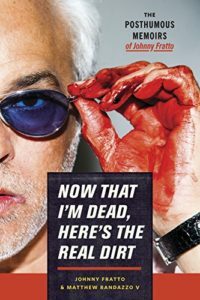 “Cruise took a liking to me … maybe he got off on my real-life stories of hustling in the underworld that made his script look dry and uninspired by comparison,” Fratto said in his book.